Sorry for the rubbish photo, it’s now too big for my normal photographing area but here it is! I’ve almost finished up to the end of part 3 now and only a few more rounds until it begins to square off. I’ve had to sneak in a few blue rounds to make the wool go further but I think if I spread them out well enough it’ll look fine. It’s definitely proving a good way to use up my yarn scraps! To illustrate just how large it’s getting, my current round has almost 200 stitches. The really big blanket I made for William had 150 in each row! This means the rounds are taking longer but I really love seeing the pattern unfold in front of me as I complete them. 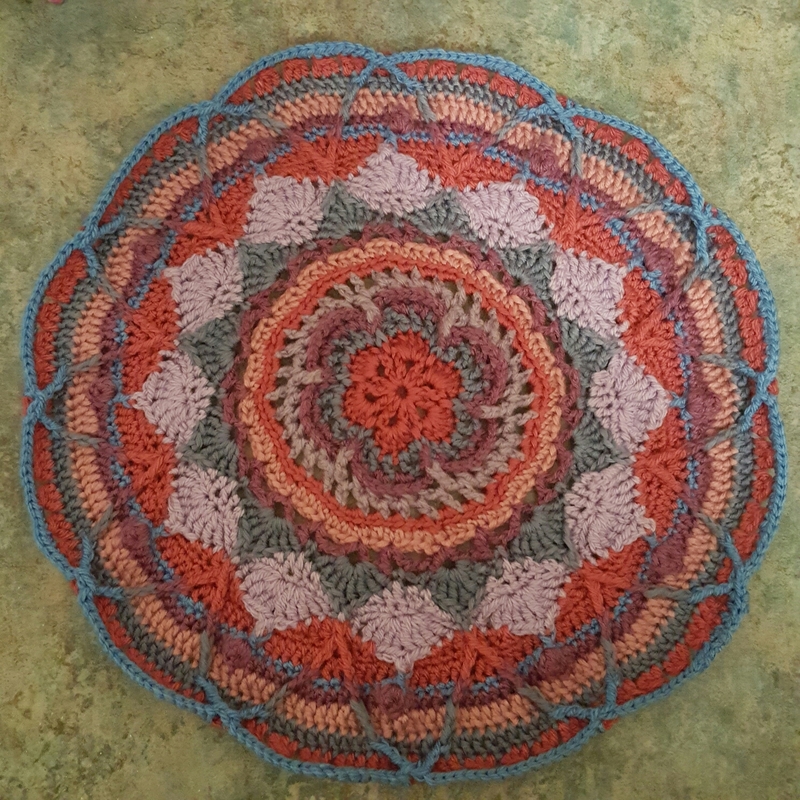 I’m already beginning to think of possible options for the back of the cushion-my yarn scraps will not stretch as far as making another one of these! How pretty is that, I love your colour scheme. What a lovely mandala.. 😉 love the colours. I am also a fan of the injection of a bit of blue – it really works. Looks like it’s going to be a lovely cushion. Thanks, it’s a good job it goes OK otherwise it would be a Borrower sized cushion. Apparently they are always on the lookout…. I like the addition of blue. It looks really pretty.